If you're a fan of keeping notes and lists then you really have two main choices -- Evernote and Microsoft's OneNote. Both can be good methods of keeping track of things. For instance, keep a tab open in your browser to add items to a grocery list as you think of them, then arrive at the store and the list is on your phone. Now Evernote is teaming up with another powerhouse in business, Google. The company is announcing that it will work with the search giant's cloud storage service, Drive. This integration is designed to better enable people to keep notes in Evernote while linking to things stored in Google Drive. "More than half of all Evernote users also have a Google Account. 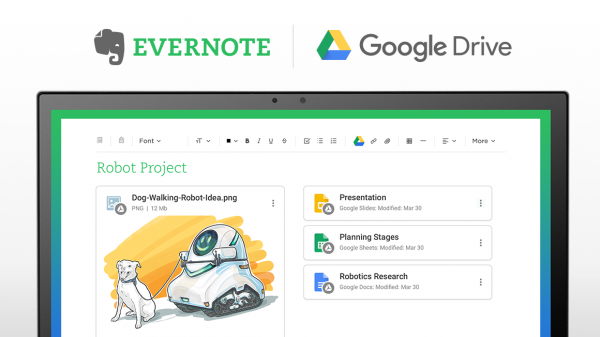 Now, everyone using Google Drive can access their Drive files in Evernote. Get ready for a rich, intuitive experience where your ideas can flow. There’s no more switching between apps, so your thinking isn’t interrupted", claims Evernote. This means that any Drive links contained in Evernote will no longer be just links, but the files will instead be visible. Users can also add Drive files without leaving Evernote. "Making Drive content available in Evernote was very natural for us", says Alex Vogenthaler, Group Product Manager for Google Drive. "Evernote is a great productivity tool and we want anyone using Drive to have access to their content whenever and wherever they’re trying to get stuff done. That’s the cloud at its best". For now, this integration is simply a beta and it has just begun to roll out. At the moment, it is only available in Chrome on the web and Android on mobile, but Evernote promises more platforms will be coming soon.